Colonel Willard Warner 180th O.V.I. Former Major of 76th O.V.I. Organized October 9, 1864, for one years service, under Colonel Willard Warner, it moved at once to Tennessee and operated with the "Railroad Brigade" during Hood's invasion. In January, 1865, the Regiment moved to Washington City, then to North Carolina, and participated in the battle at Kinston, with a loss of forty-two officers and men. It performed garrison duty until the close of the war and was mustered out July 25, 1865. 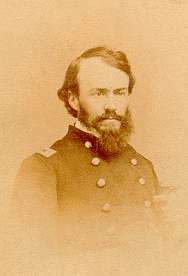 Colonel Warner was a native of Licking county, a member of General Sherman's staff and promoted to Major General by Brevet. 180th Regiment Infantry. Organized at Camp Chase September-October, 1864. Left State for Nashville, Tenn., October 15. Attached to 3rd Brigade, Defences of Nashville & Chattanooga Railroad, Dept. of the Cumberland, to January, 1865. 1st Brigade, 1st Division, 23rd Army Corps, Army of the Ohio, and Dept. of North Carolina, to July, 1865. SERVICE.--Moved from Nashville to Decherd, Tenn., October, 1864, and guard duty on line of the Nashville & Chattanooga Railroad, Right Wing at Decherd, Left Wing at Elk River Bridge, till January, 1863. Moved to Nashville, Tenn., January 6; thence moved as Train Guard to Columbia, Tenn., January 10. Return to Nashville and movement to Washington, D.C.; thence to North Carolina January 16-February 25. Campaign of the Carolinas March 1-April 26. Advance on Kinston and Goldsboro March 6-21. Battle of Wise's Forks March 8-10. Occupation of Kinston March 14. Occupation of Goldsboro March 21. Advance on Raleigh April 10-14. Occupation of Raleigh April 14. Bennett's House April 26. Surrender of Johnston and his army. Duty at Raleigh, Greensboro and Charlotte, N. C., till July. Mustered out July 12, 1865. Regiment lost during service 1 Officer and 5 Enlisted men killed and mortally wounded and 1 Officer and 84 Enlisted men by disease. Total 91.